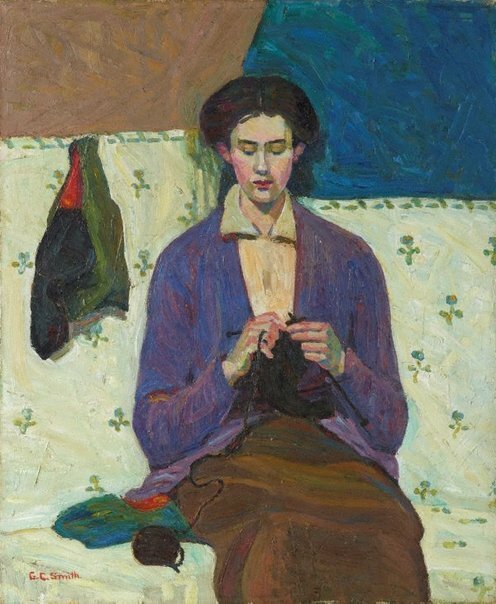 Grace Cossington Smith's 'The sock knitter' has been acclaimed as the first post-impressionist painting to be exhibited in Australia. A remarkable student work, the painting signalled a challenge to the artistic traditions of the time. The extreme flattening of the picture plane and the use of bright, expressive, broken colour applied in broad brush-strokes to delineate form reflects the aesthetic concerns of European painters such as Cézanne, Matisse and van Gogh. The subject of the painting is Madge, the artist's sister, knitting socks for soldiers serving on the frontline in World War I. Distinctly modern in its outlook, 'The sock knitter' counterpoints the usual narratives of masculine heroism in wartime by focusing instead on the quiet steady efforts of the woman at home. Signed l.l. corner, red oil "G.C.Smith". Not dated. Signed and dated top c. verso on canvas, pen and black ink "... 1914-1918/ G. Cossington Smith". Betty Churcher, Australian notebooks , 'Art Gallery of New South Wales', pg. 45-90, Melbourne, 2014, front cover (colour illus., detail), 70, 71 (colour illus. ), 255. Jackie de Diana, Look , 'Art and Australia: More views of European preludes and parallels', pg. 16-17, Sydney, Nov 2010, 16. Deborah Edwards, Australian art: in the Art Gallery of New South Wales , 'Moderns', pg. 103-104, Sydney, 2000, 103-104, 113, 302. Joanna Gilmour, Portrait profile: Grace Cossington Smith , 'Portrait profile', pg. 2-7, Canberra, 2009, 3 (colour illus.). Anne Gray, Grace Cossington Smith , 'The sock knitter', pg. 118-121, Canberra, 2005, 12 (colour illus. ), 24, 118 (colour illus. ), 92, 95, 103, 119-121, 123, 127, 174. Lelsey Harding, Art and Australia (Vol. 36, No. 4) , 'Tempe Manning: the lost modernist', pg. 532-537, Sydney, 1999, 532 (colour illus.). Lesley Harding, Cubism & Australian art , 'L'Esprit Nouveau 1913-1929', pg. 19-47, Melbourne, 2009, 25 (colour illus.). Deborah Hart, Look , 'Grace Cossington Smith: looking bakc at a life of colour and light', pg. 28-31, Sydney, Nov 2005, 28. Dr Deborah Hart, Symposium papers: Colour in art - revisiting 1919 & R-Balson , 'Beatrice Irwin and Grace Cossington Smith: women on the wings of colour in art', pg. 17-22, Sydney, 2008, 18-19. Bruce James, Australian painters of the twentieth century , 'Grace Cossington Smith', pg. 40-51, Sydney, 2000, 42. Bruce James, The Sydney Morning Herald , 'In the shadow of the master', pg. 3, Sydney, 28 Nov 1998, 3. This appears in the Sprectrum section of the newspaper. Bruce James, Art Gallery of New South Wales handbook , 'Australian Collection: Painting and Sculpture', pg. 102-181, Sydney, 1999, 132 (colour illus.). Jenny McFarlane, Art and Australia (Vol. 43, No. 2) , 'Grace Cossington Smith: a golden thread running through time', pg. 171-172, Sydney, Dec 2005-Feb 2006, 171. Drusilla Modjeska, The Weekend Australian magazine , 'A woman's lot', pg. 22-25, Sydney, 21 Aug 1999-22 Aug 1999, 23 (colour illus.). Drusilla Modjeska, Brought to Light: Australian Art 1850–1965 from the Queensland Art Gallery collection , 'A Singular Portrait. Grace Cossington Smith Portrait of a man', pg. 120-123, Brisbane, 1998, 120, 122 (illus. ), 123. Ursula Prunster, Look , 'Australian Painters: Seeing Cézanne', pg. 20-21, Heidelberg, Nov 1998, 20 (colour illus.). Virginia Spate, Art Monthly Australia , 'Amazing Grace: Thoughts inspired by the Grace Cossington Smith exhibition at the National Gallery of Australia, Canberra', pg. 22-30, Canberra, Aug 2005, 22 (colour illus. ), 23-24. Peter Stanley, Digger Smith and Australia's Great War: ordinary name--extraordinary stories , 'The Smiths at home', pg. 82-93, Sydney, 2011, 85 (colour illus. ), 358. Daniel Thomas, Sydney moderns: art for a new world , 'Foreword', pg. 11-12, Sydney, 2013, 11, 29 (colour illus. ), 315. Daniel Thomas, Art Gallery of New South Wales Quarterly , 'Grace Cossington Smith', pg. 510-521, Sydney, Jan 1970, 511 (illus. ), 512. Roland Wakelin, Art Gallery of New South Wales Quarterly , 'Post Impressionism in Sydney: Some personal recollections', pg. 91-95, Sydney, Jan 1962, 91. Anthony White, The Cambridge companion to Australian Art , 'Foreign natives: Australian Modernism 1915-1955', pg. 109-121, Port Melbourne, 2011, 110, 353. fig.no. 9.1 (colour illus. ), between pg. 124 and 125. Judith White, Look , 'Looking back at the AGNSW… when there was only one curator: Daniel Thomas in conversation with Steven Miller' edited, pg. 31-34, Sydney, Dec 2009-Jan 2010, 31 (colour illus. ), 32. Judith White, Look , 'Life, love and the woman artist', pg. 22, Melbourne, Sep 1999, 22. Living stones: St Swithun's Pymble 1901 - 2001 , Wahroonga, 2001, 42 (illus.). Exhibitions events - Art Gallery of New South Wales , Sydney, Nov 1998-Jan 1999, back (colour illus.). Australia's best painters: Tom Roberts, Hugh Ramsay and Thea Proctor , Port Melbourne, 1997, 8, 28, 38. Good Weekend , Sydney, 20 Jul 1996, 8,22. Beyond the battlefield: Women artists of the two world wars , London, 2014, 49,50, 51 (colour illus. ), 278. Australian Modern Painting Between the Wars 1914-1939 , 'Light in Sydney', pg. 30-41, Sydney, 1989, 32. The new McCulloch's encyclopedia of Australian art , ‘Australian art and artists’, pg. 190-199, Carlton, 2006, 194. Important Australian art. Auction 3 May 2017 , 2017, 59 (colour illus.). To paint a war: The lives of the Australian artists who painted the Great War, 1914-1918 , Port Melbourne, 2017, 152 (colour illus.). Scribblers: a ladies literary society in Brisbane 1911 , 'Highly achieving women', pg. 10-17, Kenmore, 2007, 11 (colour illus. ), 12. Texts and textiles: Affect, synaesthesia and metaphor in fiction , Newcastle upon Tyne, 2016, 119 (illus.). Art Gallery of New South Wales Quarterly , 'Acquisitions for 1960', pg. 58-67, Sydney, Apr 1961, 58, 61 (illus.). The CBUS collection of Australian art , Melbourne, 2009, 67. Concerning the Spiritual: The influence of the Theosophical Society on Australian Artists 1890-1934 , 'Science versus Spirit: Colour-Music in Sydney', pg. 122-153, North Melbourne, 2012, 144.